Here you can find all information about the cannabis breeder Grand Daddy Purp. 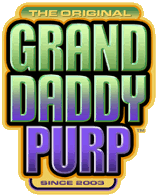 We've collected data about 19 Cannabis Strains breed by Grand Daddy Purp (3 of this strains got reviews of the SeedFinder users, with an average rating from 7.55 out of 10!) Click on the strains to find more informations, pictures, reviews, comparisons and sources for a variety - and/or check out the Breeder Info here at the page to find out more about Grand Daddy Purp. Its also possible to visualize all Grand Daddy Purp strains together with all their Parents or Hybrids with our dynamic maps - check it out! Click here to visualize all Grand Daddy Purp strains including all known hybrids and descendants with our dynamic map! Here you can watch all Grand Daddy Purp strains and their ancestors (sorted by origin) with our dynamic strain map! Superior Strains Provided By K W Estes Mediceuticals, My name is Ken Estes and I’ve been advocating for the legal use of Medical Marijuana for over 20 years. Over the years I have opened several Medical Marijuana cooperatives and have hybridized some of the best strains of marijuana available in collectives today., Strains that are proven effective for the treatment of such medical conditions as glaucoma, constant pain due to illness or injury, loss of appetite, gastrointestinal disorders and other problems. My “Grand Daddy Purp” strain, developed in 2003, is known world wide for its ability to control pain while allowing you to stay focused.